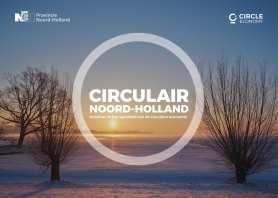 The world's first Circle Regional Scan performed by Circle Economy highlights opportunities to implement practical and scalable strategies on a regional level, for the circular economy. Regions and cities are increasingly starting to look for means to create a stronger and more resilient economy while maintaining a clean and healthy living environment. The Circle Regional Scan provides insight into where and how regions and provinces can start the transition towards a circular economy by collaborating and connecting material flows. The scan identifies key economic clusters and shows what the benefits in terms of materials savings, CO2 emission reductions and job creation could be if circular strategies are applied. By showcasing and implementing on the ground and practical pilots, regions can play a pivotal role in the transition towards a circular economy, and create healthy, liveable and waste free communities.